Swimmer’s ear, also known as otitis externa, is an inflammation of the outer ear canal. Although it is most prevalent among young adults and children, who often contract the condition from frequent swimming, swimmer’s ear can affect anyone. Swimmer’s ear is an inflammation of the outer ear that may lead to a painful and often itchy infection. It begins with the accumulation of excess moisture from swimming or daily showering. The skin inside the ear canal may flake due to moisture. This flaking may cause persistent itching that may lead to a break in the skin from scratching. Broken skin allows bacteria or a fungus to infect the tissues lining the ear canal. Swimming in polluted water can easily bring harmful bacteria into the outer ear. In swimmer’s ear, the patient nearly always has a history of recent exposure to water combined with mild injury to the skin of the inner ear. This injury is typically caused by scratching or excessive and improper attempts to clean wax from the ears. Wax is one of the best defense mechanisms the ear has against infection due to the protection it offers from excess moisture and the environment it provides for friendly bacteria. Earwax should not be removed by such sharp objects as fingernails or hairpins. If the wax is scratched away, it becomes easier for an infection to occur. The infection itself is usually caused by gram-negative bacilli (Pseudomonas aeruginosa or Proteus) or by fungi (Aspergillus) or even yeasts that thrive in moist environments. There are a surprisingly large number of different organisms that can cause otitis externa; one study of 2039 patients diagnosed with swimmer’s ear found that 202 different species of bacteria, 32 species of yeast, and 17 species of mold could be identified as the infectious agents in this group of patients. In recent years, some of the organisms most likely to cause otitis externa have developed resistance to antibiotics; the resistant organisms vary from country to country. One Asian study found that Staphylococcus aureus is responsible for more cases of swimmer’s ear in East Asia than Pseudomonas aeruginosa, and that methicillin-resistant S. aureus, or MRSA, is an increasingly worrisome problem in these countries. A study done in Texas, however, found that Staphylococcus epidermidis was responsible for the largest number of antibiotic-resistant cases. In a minority of cases, otitis externa is caused by an allergic reaction. The most common allergens in chronic otitis externa are topical medications used in the ear, particularly preparations containing neomycin; nickel and other metals used in inexpensive earrings; and some materials used to make hearing aids. The symptoms of swimmer’s ear include swelling, redness, heat, and pain. The inflammation may produce a foul-smelling, yellowish, or watery discharge from the ear. The skin inside the ear canal may swell to the point that the examiner cannot see the patient’s eardrum. The patient may also experience itching inside the ear and a temporary minor hearing loss due to the blockage of the ear canal. The severe pain and tenderness associated with the condition may intensify when the patient’s head is moved, or if the examiner gently pulls the earlobe. The diagnosis of swimmer’s ear is made from clinical observation. The doctor looks inside the ear with an instrument called an otoscope . The otoscope allows him or her to see whether there is swelling, redness, and a discharge. The doctor may also take a specimen of the discharge by swabbing just inside the ear. This specimen is then sent to a laboratory to identify the bacterium or fungus. Swimmer’s ear is not usually a dangerous infection and often heals itself within a few days. If the infection is mild, alternative methods of treatment may be beneficial. Native Americans used mullein (Verbascum thapsus) oil to treat minor inflammations. To ease the discomfort of swimmer’s ear, 1–3 drops of a mullein preparation may be placed in the ear every three hours. Garlic (Allium sativum) has been shown to be effective in treating swimmer’s ear. As a natural antibiotic, garlic is a useful herb for inflammation of the outer ear. Equal parts of garlic juice and glycerin are added to a carrier oil, such as olive or sweet almond. One to three drops of this mixture may be placed in the infected ear every three hours. Specific homeopathic remedies for swimmer’s ear may include Aconite, Apis, Graphites, or Pulsatilla. A homeopathic practitioner should always be consulted for specific treatment recommendations. A 1997 German study found that homeopathic treatments reduced the duration of pain in children with ear infections more quickly than those treated with conventional drugs. The homeopathic-treated group was also found to have a greater resistance to recurrence of the infection within one year after treatment. The infected ear canal may be washed with an over-the-counter topical antiseptic. A homemade solution using equal parts white vinegar and isopropyl alcohol may be placed, a few drops at a time, into the ear every two to three hours. The vinegar-alcohol drops should be kept in the ear for at least 30 seconds. A warm heating pad or compress may be placed on the ear to relieve pain. Pain may also be eased by taking aspirin or another analgesic. To assist the healing process, the infected ear canal should be kept dry. When showering, the patient should use earplugs or a shower cap. A doctor will use conventional medicine to treat swimmer’s ear. The ear is typically cleaned with a cotton-tipped probe or a suction device to relieve irritation and pain. Ear drops containing a combination of hydrocortisone to help relieve the itching and an antibiotic to fight infection (usually neomycin sulfate and polymyxin B sulfate ) may be prescribed. For severe pain, doctors may recommend aspirin, acetaminophen, or some other over-the-counter pain medication. To assist the healing process, the infected ear must be kept dry. An infection typically begins to improve within three to four days. If the pain persists or becomes worse, the doctor may prescribe an oral antibiotic or an anti-inflammatory drug. If the doctor prescribes an oral antibiotic to treat the infection, it is important for the patient to finish taking the entire course of medication even if he or she feels better fairly quickly. The reason is that a single antibiotic can kill off most of the bacteria causing the infection, but a few organisms may survive that have a higher degree of natural resistance to the drug. If the patient stops taking the antibiotic too soon, not all the bacteria will be killed off, and those that survive may develop resistance to the particular drug that was used. If the otitis externa is caused by an allergic reaction, a patch test is necessary in order to identify the substance or object that is causing the reaction. Treatment consists of avoiding further contact with the allergen; or switching medications if the patient has developed an allergic sensitivity to a topical ear medication. 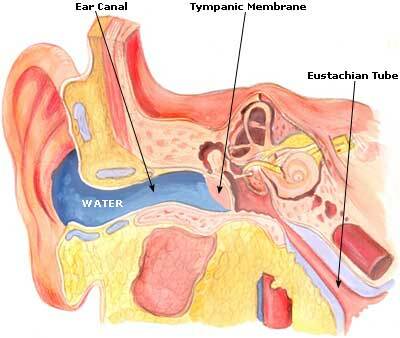 Swimmer’s ear is usually a minor inflammation of the outer ear canal that may even heal itself within a few days. It usually responds to many alternative treatments as well as to the conventional methods prescribed by doctors. Rapidly spreading redness and swelling of the outer ear or nearby skin, or fever, are indications of an aggressively spreading infection. These symptoms require immediate medical attention. Prevention is the key component in avoiding swimmer’s ear. Patients should be careful when cleaning the ears—never dig into the ear canal; wear earplugs when swimming and avoid swimming in dirty water; and use earplugs or a shower cap when showering. Additional methods to ensure the prevention of swimmer’s ear include: putting a dropperful of isopropyl alcohol or white vinegar into the ear after swimming or showering to dry out the ear and help kill germs; before swimming, create a protective coating by squirting a dropperful of mineral oil, baby oil, or lanolin into the ear; and when wearing a hearing aid, remove it often to allow the ear an opportunity to dry out completely.